Bhagvan Ramdevji Maharaj was a Tomar Rajput regarded as the incarnation of Lord Krishna. History goes that five Pirs from Mecca came to test his miraculous powers and after being convinced, paid their homage to him. Since then he is venerated by Muslims as Ramshahpir or Ramapir. The fame of Ramapir reached far and wide. He believed in the equality of all human beings, both high and low, rich and poor. He helped the down trodden by granting them their wishes. Bhagvan Ramdevji Maharaj took samadhi (conscious exit from the mortal body.) in 1459A.D. Maharaj Ganga Singh of Bikaner constructed a temple around the samadhi in 1931A.D. The devotees of Ramdevpir offer rice, coconuts, churma and toy wooden horses to Ramdevji. The samadhi temple is in Ramdevra, Rajasthan. Around 1300 A.D. there was a King called Anangpal, a Tunvar Rajput who ruled over Delhi. 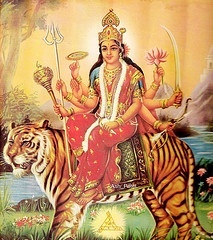 He had two daughters Kamladevi and Roopsundari. 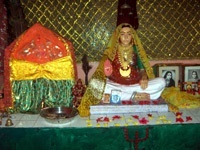 Kamladevi was married to the King of Ajmer called Someshwar Chauhan. King Someshwar had a son called Prithviraj Chauhan. Roopsundari was married to King Vijaypal of Kanoj. He also had a son named Jaychand. Since King Anangpal had no sons, he adopted Prithviraj Chauhan and declared him to be the successor to the throne of Delhi. King Anangpal gave to his other relations the towns under his jurisdiction. He also gave away Pokran and Phaloji and the surrounding four Jojan land to Dheersinh Tunvar who was a close relation to King Anangpal. Dheersinhji Tunvar had a son whose name was Ransinhji Tunvar who in turn had two sons called Ajmalji Tunvar and Dhanroopji. Ajmalji married Minaldevi or Minalde, Princess of Jaisalmer. After becoming King of Pokran, King Ajmalji had only three daughters, Lasa, Laxmi and Sugana. Why Hindus Believe Ramdevpir to be The Incarnation of Lord Krishna? King Ajmalji had no sons and so he became a ritualistic devotee of Lord Shiva and regularly made pilgrimages to Kashi, now known as Banaras, the holy city on the banks of River Ganges. There, he offered his prayers to Kashi Vishvanath in his desire to have a son. Since he learnt that the citizens of Pokran considered him to be ominous, he decided to end his life in Kashi, if Kashi Vishvanath did not grant him his wishes for a son. 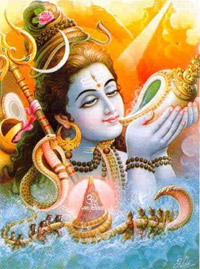 He went to Kashi Vishvanath and put himself to penance and chanting the mantra “Aum Namah Shivaya” offered his prayers. On the seventh day at midnight he saw Lord Shiva in his dream, and told King Ajmalji to go to Dwarka where his wish would be fulfilled. The next day he was on his way back to his Kingdom, Pokran where in his absence, his wife Queen Minaldevi had been fasting and had put herself under penance. He told the Queen about his dream in Kashi and deciding to go to Dwarka with a tiffin full of sweet balls to offer to Lord Krishna known in Dwarka as Dwarikadhish or Ranchhodrai. In the temple of Dwarka he started conversing with Ranchhodrai in the form of a deity, which obviously would not reply as it was made of a stone. A gugali (a type of Brahmin) priest advised Ajmalji that if he wanted to meet the real Ranchhodrai he will need to jump into the sea as his capital the Golden Dwarka was under the sea. The legend goes that he met Lord Krishna in Golden Dwarka. He granted him his wish for a son and gave him a flower, but the King insisted he wanted a son like the Lord himself in which case Krishna had no alternative but to take birth himself. Ranchhodrai gave him another flower and promised that he will take birth at the appropriate time as his younger son. He told him to name both the sons Viramdev and Ramdev. He gave his three other emblems – Vir Gediyo, box of Amal and Ratna Katora. Ajmalji bowed down to touch the feet of Ranchhodrai and closed his eyes. When he opened his eyes he found himself on the beach. He collected his horse from the Gugali priest and was on his way back home. As night approached, he rested on the side of the road and fell asleep. When he woke up he found himself on the outskirts of Pokran. He entered Pokran and went to his Royal Palace, and was greeted by his wife and ministers. He placed both flowers in a small temple within the palace. After ten months the Queen gave birth to a son. He was named “Viramdev”. Then on Thursday Bhadon Sudi 11(Ekadashi) in the year VS 1461 (1405 A.D). Lord Krishna arrived in the form of a baby boy and laid down next to Viramdev in the cradle. The Queen saw the kum kum foot prints leading up to the cradle. This baby boy was named Ramdev. Why do Muslims call Ramdevji “Ramshahpir” or “Ramapir”? As time passed by, Ramdevji became well known in Rajasthan for his miraculous powers. The Hindus who had become Muslims under compulsion from the Islamic rulers of the Delhi Sultanate started reverting back to Hinduism. The Fakirs (Muslim religious devotees) reported this disreputable situation of Muslims to the Pir of Ajmer. The Pir of Ajmer asked the Fakirs to go to Multan (a historical town now in Pakistan) and see Mustanapir, Dagdupir, Bajrukshahpir, Gadadiapir, Dilavarshahpir and Jabbarpir and follow their advice. The Fakirs went to Multan and saw the Pirs who in turn sent the Fakirs to see their superiors Musapirs and Charalshahpir. After listening to the pleas of the Fakirs, Musapir decided to go to Ranuja with his small delegation of five Pirs (including himself) and he sent a message to all Fakirs of Multan to arrive in Ranuja on Maha Sudhi 2 so that he could take some tough tests of Ramdevji, the aim being that if Ramdevji failed the tests then Musapir could ask Ramdevji to stop people calling himself a Pir since Hindus do not have Pirs. In Ranuja, Ramdevji had already become aware of the intentions of Musapir and was awaiting their arrival. 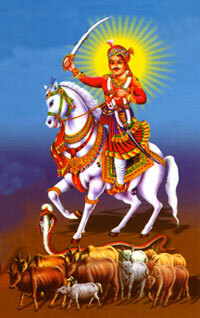 On Maha Sudhi 2, by their miraculous powers, a delegation of five Pirs arrived on the outskirts of Ranuja. Ramdevji went to receive them, introducing himself and escorted then to the palace. Meanwhile, the rest of the Fakirs and Pirs started arriving in Ranuja. By lunchtime they had all arrived. Whilst the Pirs and Fakirs from Multan were in Ranuja, they experienced the miraculous powers of Ramdevji. When Musapir and his four delegates arrived in Ranuja, Ramdevji made the five Peepal (Banyan) trees grow instantly so that Musapir and his delegates could rest for some time before going into the town. He also miraculously produced pots and pans for the opium drink to be prepared. y was lying and Ramdevji miraculously resuscitated him. At lunchtime, Ramdevji, by his miraculous powers, accommodated all the Pirs and Fakirs from Multan on a single piece of carpet, say 3’x 3’ which when sat upon extended another 3’ at a time. The Fakirs would only eat from their utensils, which they had left behind in Multan and so Ramdevji extended his right hand and produced all the necessary utensils for them to eat from. Ramdevji also provided various types of delicacies and relishes that were requested and fulfilled the wishes of the Fakirs and Pirs. The Pirs and Fakirs intentions were to bring disgrace upon Ramdevji, instead they blessed him and Musapir announced that Ramdevji from now on will be known as Ramshahpir, Ramapir or Hindawapir in the whole world and all the Pirs and Fakirs present hailed to Ramdevji “Jai Ramapir, Jai Ramapir”. To ensure the Pirs and Fakirs had a safe journey home, Ramdevji sent them home on a single branch of the Banyan tree, which he had grown earlier.